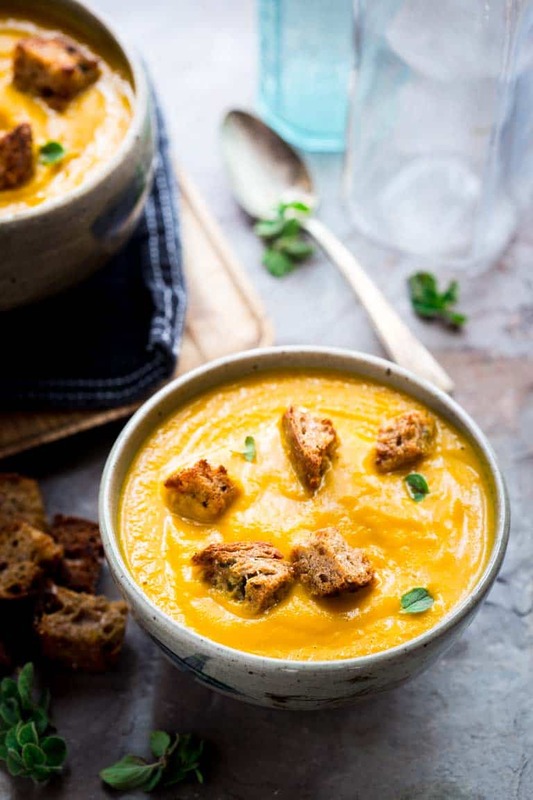 This Carrot Ginger Soup with Oregano Croutons is the perfect mid-Winter vegan soup! And it is only 123 calories per serving. Granny smith apples, fresh ginger and thyme add wonderful layers and depth of flavor and the aromatic and crunchy oregano croutons make it extra special. I originally shared this recipe on February 28, 2012. I have updated the images and some of the text today. This soup always makes me think of a client I had when I worked as a personal chef. She requested it when she wasn’t feeling well. She said she felt like it was “clean.” This was before the whole concept of clean eating really took off, but it is exactly what clean eating is all about. I guess she was somewhat of a trend setter! And I kind-of agree that this is a really clean recipe. It is so pure and comforting. I love the little pop of ginger that warms me up from the inside. It is just perfect for this long of winter, where I feel like I too need a little clean eating. I also love it served cold in warmer months. I have to make these Skillet Garlic Parmesan ChickenThighs by Krista!! All you salad lovers out there will love this Zippy Pear Goat Cheese Kale Salad by Lindsay. 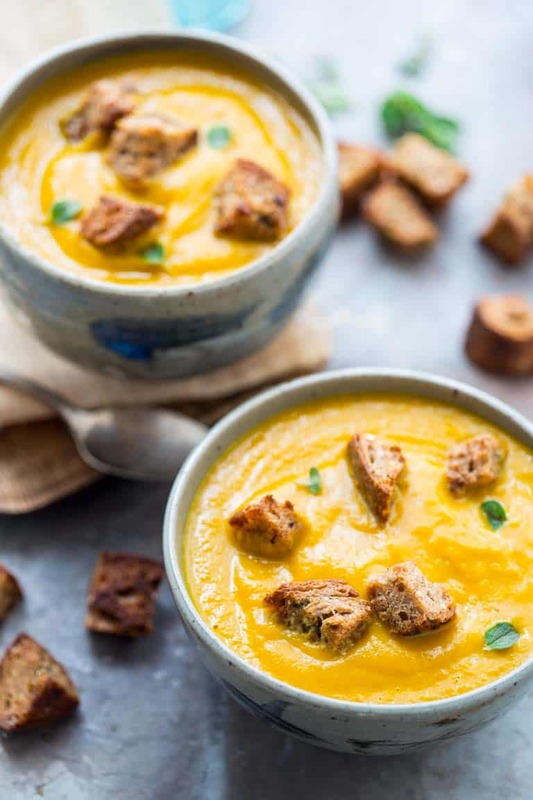 This Carrot Ginger Soup with Oregano Croutons is the perfect mid-Winter Vegan soup! Granny smith apples, fresh ginger and thyme add wonderful layers of flavor and the oregano croutons make it extra special. 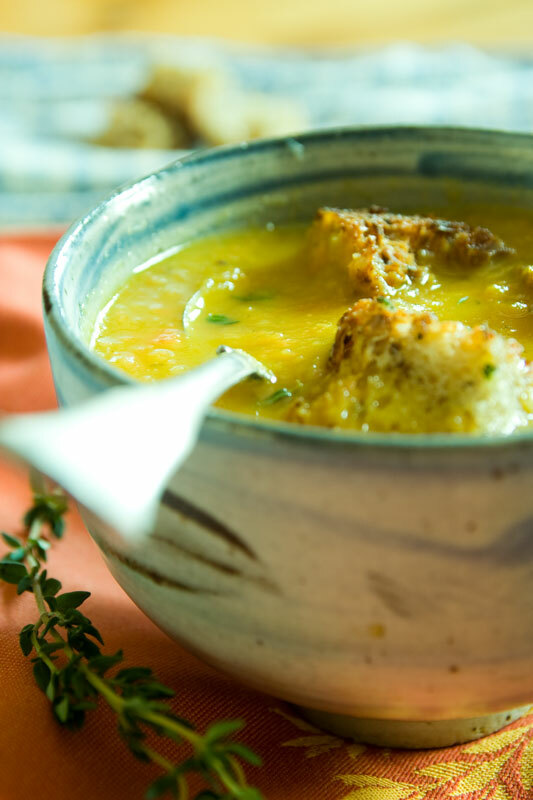 Heat 2 tablespoons oil in a large heavy-bottomed soup pot or Dutch oven over medium-high heat. Add apples, onion, carrots, celery, ginger, thyme, 1 ¼ teaspoon salt and pepper, cover and cook, removing lid to stir often, until the apples have broken down and the vegetables are starting to caramelize slightly along the edges of the pot, 15 to 17 minutes. Add broth, increase heat to high and bring to a boil. Reduce heat to medium-low to maintain a simmer and cook,stirring occasionally, until the vegetables are very soft, 15 to 20 minutes. Puree with an immersion blender. Alternatively, puree in blender in batches. Use caution when blending hot liquids! Stir in vinegar. Preheat oven to 350 degrees F. Stir garlic, 2 tablespoons olive oil, oregano, ½ teaspoon coarse salt, and pepper in a large bowl. Add bread cubes and toss to coat. Spread out on a large baking sheet and bake until crispy, stirring once, 10 to 12 minutes. 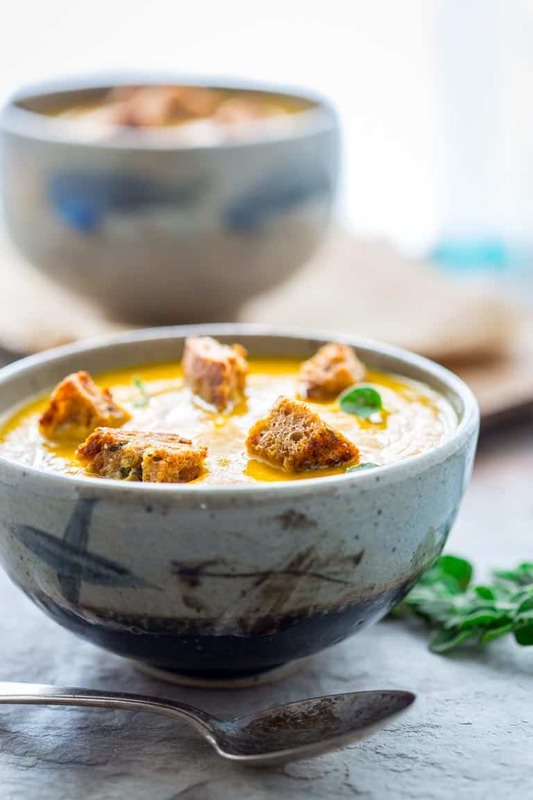 Serve croutons with soup. 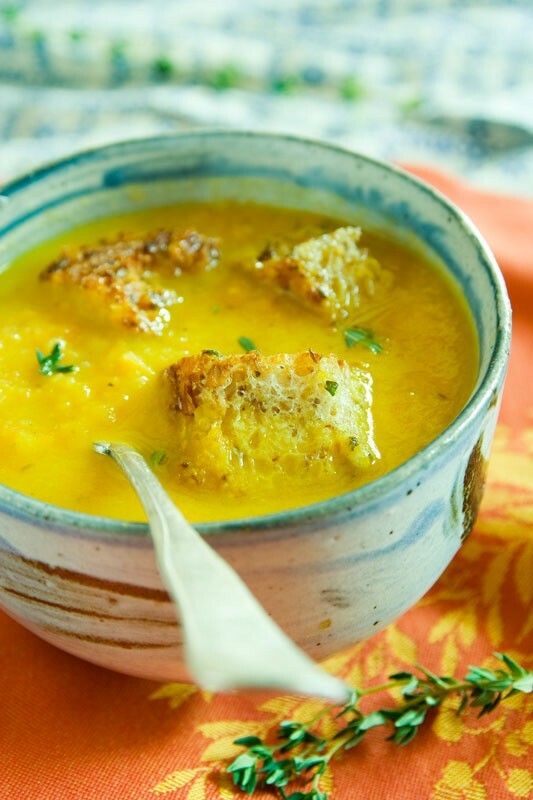 The combination is perfect…Soothing soup for the whole family! Thanks mufudo. My kids love it too. 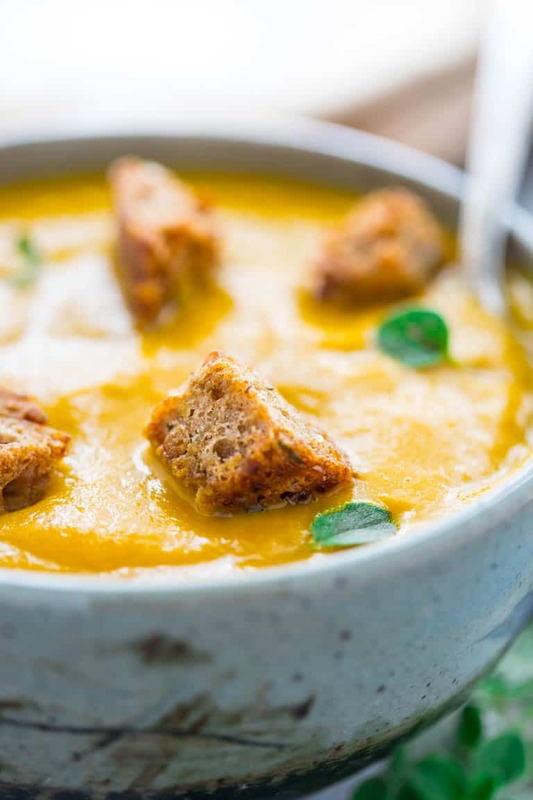 On a rainy day like today, that soup would be just the ticket. I can see why your client loved it so much. It looks soothing and nourishing. Yes it is just that. So glad you came by for a visit. I made this tonight and it was delicious. Thank you so much for uploading this. I have this cooking on the stove right now. Couldn’t resist, as it is perfect for this fall weather. Thanks again, Katie. I agree. 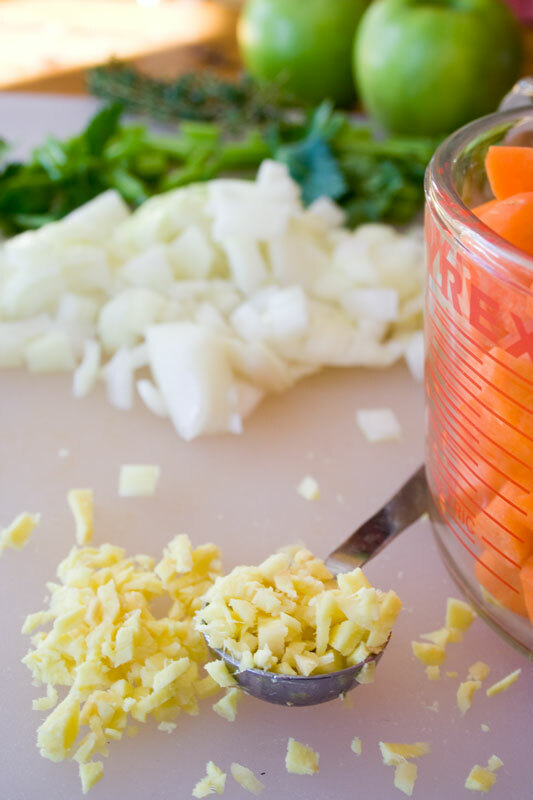 A chill in the air always makes me want to cook soup. I’m wishing we had planted carrots in the garden this year. Looks like I’ll be stopping at the farmers market on Friday. Croutons on soup? Genius! 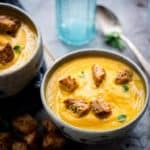 I’m all about the homemade croutons, but I’ve never thought about putting them on soup. I usually using ginger to cook soup when fall or winter come. But I never cook it with carrot. So I wanna try it as soon as possible! It looks delicious!